Victoria, the Capital of British Columbia was first established in 1843 as a Hudson’s Bay Company trading post. When gold was discovered in the sandbars of the Fraser River and many of its turbulent tributaries Victoria grew almost overnight into a large town. For many years it was the capital of the crown colony of Vancouver Island and soon after this colony and British Columbia were united and the Capital of the greater territory was transferred from the mainland to Victoria. As an administrative center and an important naval and military point Victoria gained importance. By the 1860s Johnson Street was a small collection of wooden structures that housed various businesses and a number of saloons. It was considered the “rough edge” of town where no respectable citizen would roam after dark. In the 1880’s a gentleman named William Grimm who had emigrated from Germany opened Grimm’s Carriage Factory in a wooden structure in the same location the hotel is at today. The factory continued to house various livery and stable businesses through until 1912 when William Grimm died at the age of 68. 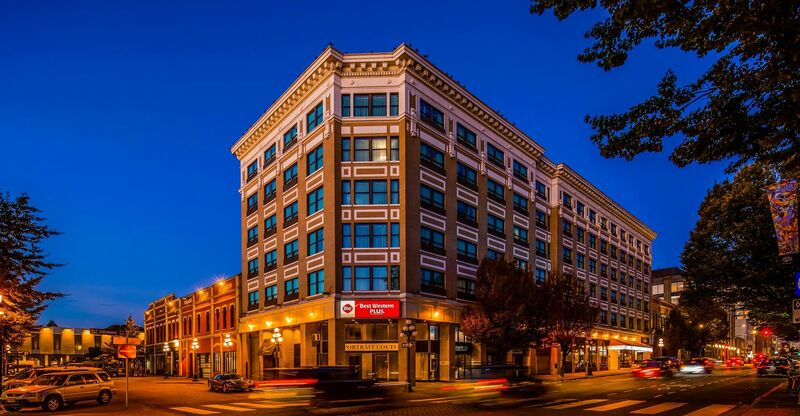 It was in this year of 1912 that Sir Charles Hayward who was born in Essex, England in 1839 and immigrated to Victoria in 1862 commissioned architects Breseman&Durfee to design and build his new hotel located at 642 Johnson Street. The old wooden building was torn down so that the new tan brick and white terracotta building could be constructed during the pre-World War I building boom. 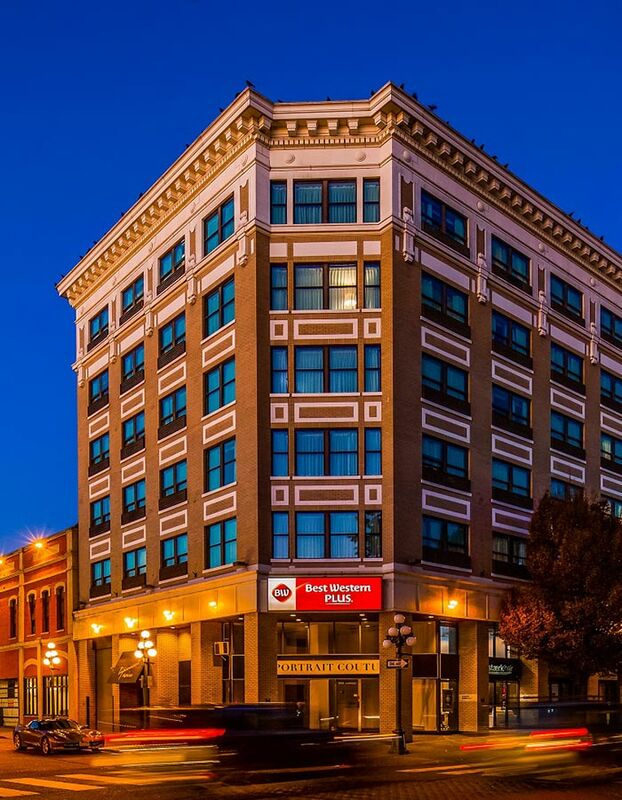 This time period saw a number of new and magnificent buildings constructed such as the Prince George Hotel (became the Douglas Hotel in 1918, and is known as the Hotel Rialto today), the Belmont Office Building (home to the restaurant Pescatores), the Strathcona Hotel, and the Royal Theatre. The hotel was to be named the Carlton Hotel but at the last minute the name was changed to the Saint James Hotel. The building took two years to complete and was first entered into the 1914 City of Victoria Directory. At this point in time the hotel only took up half of Johnson Street between Douglas and Broad. The Saint James Hotel lasted from 1914 to 1954 when the name changed to the Olympic Hotel and then to the Royal Olympic Hotel. The hotel offered 50 rooms and there was an air of optimism with the anticipation of a convention centre opening in the down town core which sadly never materialized. Rates were as low as $3.50 at this time! In the early 1970’s there was a terrible fire in the building that started when a guest that was smoking somehow lit his pillow on fire with his cigarette. The entire inside of the building was ruined from floors 2 to 7 with water and fire damage. It was then purchased by John Perri and Bill Wellburn in 1976. These two gutted the entire hotel down to the four exterior walls and floor slabs, and then rebuilt 48 rooms. In 1981 they expanded the hotel to include the building to the west of the hotel at the corner of Broad and Johnson Street. The hotel became part of the Best Western in 1983 and at that time changed its name to The Best Western Olympic Hotel. In 1987 after a struggle with recession and high interest rates the hotel was sold off one more time and the name changed to the Best Western Carlton Plaza!